Phil Stoodley’s debut solo album No Surprise is a relaxing combination of pop, rock, electronic and disco songs that are perfect for a lazy afternoon or a drive on the open road. Originally from New Zealand, Stoodley got his start at age fifteen when he received his first guitar, and by age seventeen he was playing in rock bands making his way around the lower North Island of New Zealand. By the early 2000’s, Phil began touring with popular New Zealand rock band The Feelers, touring in the United States, the United Kingdom, and Asia. 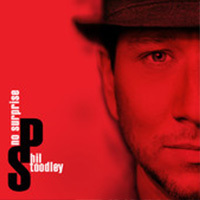 With the release of No Surprise, Stoodley proves that he can hold his own by releasing pop songs in the vein of Jason Mraz, with a vocal sound all his own. The opening song on the record, “We Don’t Talk Anymore,” is a pop song with relaxed vocals with a piano that makes the song stand out. The song’s simplicity, along with its inviting and vibrant tone make it the perfect dance tune. “Long Way From Home” has an intro that encircles the audience with its huge guitar sound. With a slight country bent, it is the perfect song to play on a long road trip as one traverses the open highway. The vocals on this track are as big as the music, giving listeners a glimpse into Phil’s wide vocal range. “Feeling Strange” is a great pop number that deviates from the sound that Phil has crafted so carefully. Bringing in a reggae guitar riff halfway through the song, the audience can get a taste of Phil’s creativity. By bringing in many different styles to write songs that sound very distinctive, listeners will immediately be able to identify Phil Stoodley before he even begins to sing. “Walk Forward In Motion” is perhaps the album's signature track. It's disco-like drum loop almost has a Bee Gee’s feel to it, joined by a myriad of different sounds that come together to create a darker, more haunting song. No Surprise is a wonderful pop album that will let listeners discover something new every time they listen, and has a song for everyone. You can download the album for free at philstoodley.com.